You already know about our high-quality MACS® Media. Exact unit dosing, eliminating laborious pre-testing. Simply fill out the form below to receive an offer and win a Happy Cells plushy. Miltenyi Biotec will be donating one of a total maximum of 200 Miltenyi Biotec Happy Cell plush toys to the organization of the winning entrant of this raffle (the “Promotion”). By entering this Promotion, you agree to be bound by the terms and conditions set forth below (the “Rules”). The promoter of this Promotion is Miltenyi Biotec GmbH (“Miltenyi”), whose registered address is Friedrich-Ebert-Strasse 68, 51429 Bergisch Gladbach, Germany (Entries should not be sent to this address). No purchase necessary to enter or win. This Promotion is open only to participants active in life science research who are 18 years or older as of the date of entry and who are members or employees of an organization validly existing and registered in Europe, North America or Australia excluding employees (and their immediate families) of the Miltenyi Biotec group of companies or their agents and suppliers. Void where prohibited by law or institutional policy. Miltenyi reserves the right to seek verification of eligibility to enter and receive a prize under these Rules. This Promotion begins on March 15, 2018 at 9:00 a.m., CET, and ends on December 31, 2018 at 11:59 p.m., CET, (the “Entry Period”). To enter, participants must request a quote for cell culture media or premium grade cytokines. During the Entry Period, each participant can submit only one (1) quote request for this Promotion, irrespective of the number of email addresses used. Participants with more than one entry will be disqualified. The winner will be drawn at random from among all eligible entries received during the Entry Period and will be notified within 30 days of the draw. During the Entry Period, there will be one draw every month on the last day of each month for all eligible entries received during that month. The last draw will be on December 31, 2018. If, in Miltenyi’s reasonable opinion, a winner selected at the draw is found to be ineligible, Miltenyi reserves the right to award the prize to another entrant and to require the return of any prize already awarded, at its sole discretion. In the event of a dispute about the identity of an online entrant, the entry will be declared made by the authorized account holder of the email address submitted at time of entry. “Authorized account holder” is defined as the natural person who is assigned to an email address by an Internet access provider, online service provider, or other organization (e.g., business, educational institution, etc.) that is responsible for assigning email addresses for the domain associated with the submitted email address. The potential winner may be required to provide Miltenyi with proof that the potential winner is the authorized account holder of the email address associated with the winning entry. A Miltenyi Biotec Happy Cell plush toy (size: 17 cm; various colors) will be donated to the organization of the winning entrant subject to Miltenyi’s terms and conditions of sale. There will be a donation of one Miltenyi Biotec Happy Cell plush toy per 10 eligible entries, limited to a total maximum donation of 200 Miltenyi Biotec Happy Cell plush toys for the whole Entry Period. The donation will be made by Miltenyi subject to the approval of the winning entrant’s organization and in accordance with any applicable legal rules, including the organization’s general policies governing gifts and donations, if any. The winner acknowledges and agrees that the acceptance of the donation by the winning entrant’s organization and the allocation and use of the prize within the organization will be at the sole discretion of the organization, and that Miltenyi will neither seek nor take influence in this respect. Miltenyi will not be responsible for any VAT, national and/or local tax liabilities incurred in claiming or using the prize, nor for any administrative or operational costs. If the winner’s organization refuses to accept the donation, Miltenyi reserves the right to withdraw prize entitlement and re-allocate such prize to a substitute winner drawn at random from among all remaining eligible entries, without further liability to the original winner. There are no cash or alternative prizes available, in whole or in part, except that in the event of totally unexpected circumstances outside its control resulting in the above prize being unavailable, Miltenyi reserves the right to provide an alternative prize of equal or greater value. The prize is non-exchangeable and non-transferable and will only be issued in the name of the winning entrant’s organization. TO THE FULLEST EXTENT PERMITTED BY THE LAW (OTHER THAN IN RESPECT OF ANY LIABILITY FOR NEGLIGENCE CAUSING DEATH OR PERSONAL INJURY), MILTENYI, AND ITS AFFILIATES, SUBSIDIARIES AND RELATED COMPANIES AND THEIR RESPECTIVE OFFICERS, DIRECTORS, EMPLOYEES, REPRESENTATIVES AND AGENTS, SHALL NOT BE LIABLE FOR ANY LOSS OR DAMAGE WHATSOEVER WHICH IS SUFFERED OR SUSTAINED AS A RESULT OF OR IN CONNECTION WITH THE PARTICIPATION IN THIS PROMOTION OR THE ACCEPTANCE, POSSESSION OR USE, OR MISUSE, OF THE PRIZE. Without limitation to the generality of the foregoing, Miltenyi, or its affiliates, subsidiaries and related companies or their respective officers, directors, employees, representatives and agents, cannot be held responsible for any errors or omissions (including in computer systems or networks resulting from technical malfunction, traffic congestion or unauthorized intervention) that may result in an entry not being registered, accepted or processed. SOME JURISDICTIONS MAY NOT ALLOW THE LIMITATIONS OR EXCLUSION OF LIABILITY FOR INCIDENTAL OR CONSEQUENTIAL DAMAGES OR EXCLUSION OF IMPLIED WARRANTIES SO SOME OF THE ABOVE LIMITATIONS OR EXCLUSIONS MAY NOT APPLY TO YOU. CHECK YOUR LOCAL LAWS FOR ANY RESTRICTIONS OR LIMITATIONS REGARDING THESE LIMITATIONS OR EXCLUSIONS. By participating in this Promotion, entrants agree to abide by these Rules and by the decisions of Miltenyi which are final on all matters pertaining to this Promotion. No correspondence or discussion will be entered into. This Promotion, these Rules, and any matter arising from them shall be exclusively governed by the laws of Germany except with respect to its conflicts of laws principles, and the relevant courts of Cologne, Germany, shall have exclusive jurisdiction. Unless otherwise specifically indicated, Miltenyi Biotec products and services are for research use only and not for therapeutic or diagnostic use. 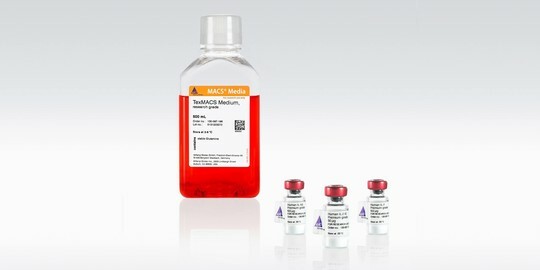 MACS, the MACS logo, are registered trademarks or trademarks of Miltenyi Biotec GmbH. COPYRIGHT © 2018, MILTENYI BIOTEC GMBH. ALL RIGHTS RESERVED.